Electric two-wheeler maker Ather Energy Pvt. Ltd launched its long-anticipated flagship scooters on Tuesday, touting their ‘intelligent’ features as differentiators from existing products in the nascent market. These features include parking assistance, remote diagnostics, and on-board navigation. 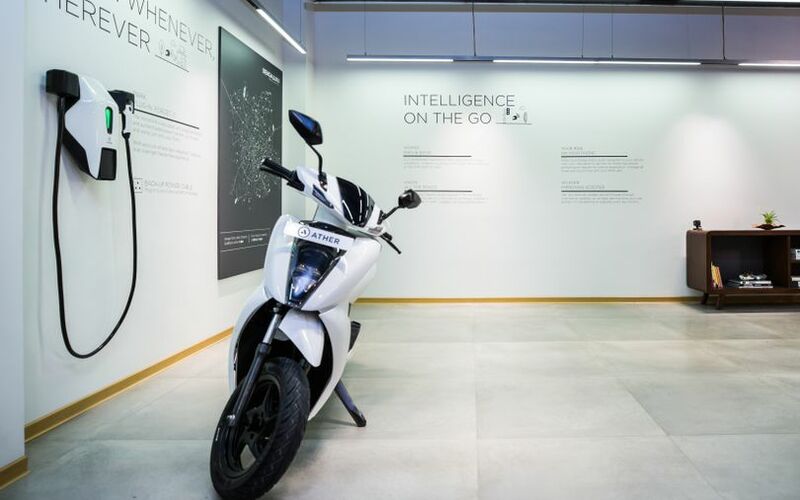 The Bengaluru-based firm, which was started by IIT graduates Tarun Mehta and Swapnil Jain in 2013, has named its scooters Ather 450 and Ather 340. The second model is a lower-priced version. Ather has built both smart scooters from scratch. The Ather 450 is priced at Rs 1,24,750 (on road) while the Ather 340 will sell at Rs 1,09,750 (on road). Both models have a 7-inch touchscreen dashboard that displays relevant information while on the road including navigation and traffic updates. Ather’s app enables push navigation from the phone to the vehicle’s dashboard. It also provides remote monitoring of the vehicle’s health, charge and helps managing service requirements. The Ather 450 also comes with parking assist, which allows riders to reverse into tight parking locations. The Ather 450 also has a home charging point that will be installed by the company at either owners’ homes or workplace. While the ordering, payment, and test-ride scheduling takes place online, the firm has opened an experience centre, AtherSpace, for customers. It will provide doorstep servicing that can be scheduled through the Ather app. On paper, the company says its offering is the fastest electric scooter in the country. The Ather 450 fast-charges to 80% at a rate of 1 km/minute. The 340 model can achieve a mileage of 60 kilometres on a single charge, while the more powerful 450 can hit 75 kilometres. Hero, YoBykes and Ampere are some of the other Indian firms which make electric scooters, albeit at significantly lower price points and top speeds. Ather is offering a monthly plan which includes free public and home charging, periodic maintenance inclusive of consumables, breakdown assistance and unlimited data services for the dashboard. The company has also installed a public charging network, AtherGrid, in Bengaluru. Ather plans to put 2,000 of the scooters on the road through August and up to 1 lakh over the next two-and-a-half years. Ather Energy co-founder and CEO Tarun Mehta said in a statement that the firm aims to expand to Chennai and Pune in the coming months. Ather Energy has thus far raised around $43 million, with two-wheeler major Hero MotoCorp Ltd and Flipkart co-founders Sachin and Binny Bansal among its backers, apart from New York-based investment firm Tiger Global. The scooter was originally supposed to be launched in the middle of 2016, but testing led to multiple delays. Mehta had earlier told VCCircle that Ather could eventually branch out into making electric bikes as well. The electric vehicles industry in the country is still at a nascent stage, comprising less than 1% of total vehicle sales, according to an Assocham study carried out with global advisory services firm EY. Charging infrastructure remains a crucial hurdle as the Indian government pushes for greater use of electric vehicles.